Take a recording of yourself and a recording of someone else; someone whose playing you like, maybe. As you listen to the recordings, focus on some aspect. 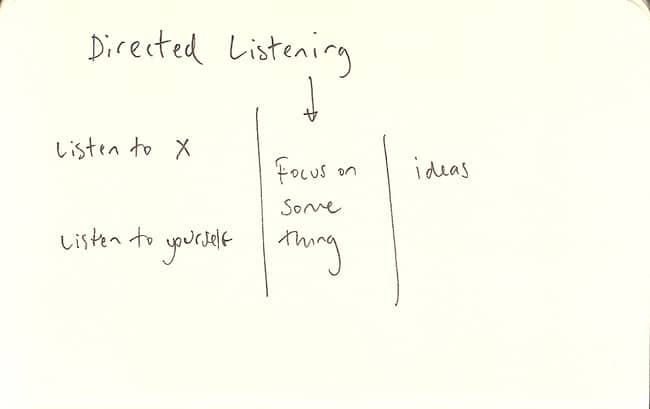 Think of your listening as filtering out everything else to bring into focus a particular thing. Having done that, what ideas does that throw up? You’re looking for ideas that you can apply to what you do. The listening could be just you. Or you might listen along with a teacher or someone else so that you get another perspective, more ideas, more insight. You could even make the comparison between yourself and, say, a dancer, poet, sculptor, whatever. If you do it, please share any ideas/insights. Also, please share any ideas of things to focus on for this exercise.